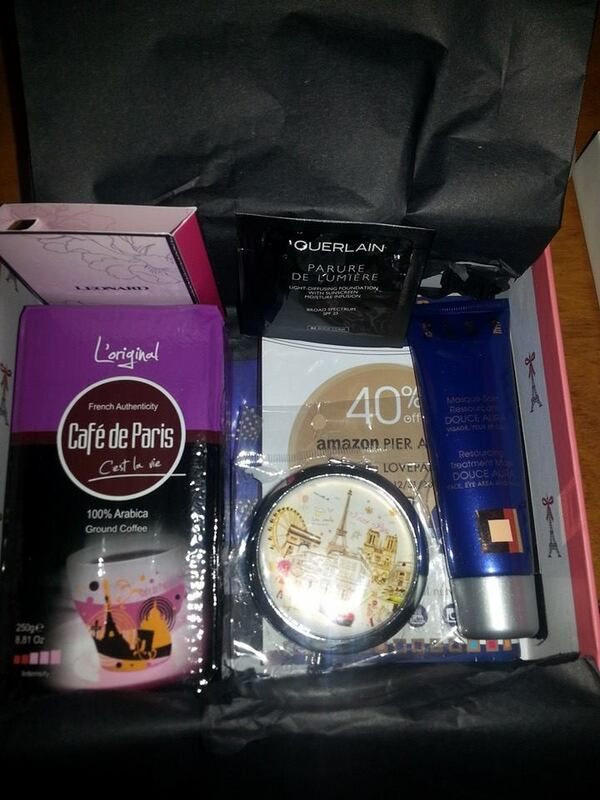 THE FRENCH BOX: NOVEMBER UNBOXING ~ I LOVE PARIS (I TRULY DO) AND COUPON CODE!!! After stalking the tracking information for my November The French Box, I woke up this morning wringing my hands in anticipation of its arrival and practically squealed when I saw the mail carrier walk past my office window with the distinctive pink box in her hands. After carefully removing it from its outer shipping box, my little black heart skipped a beat. 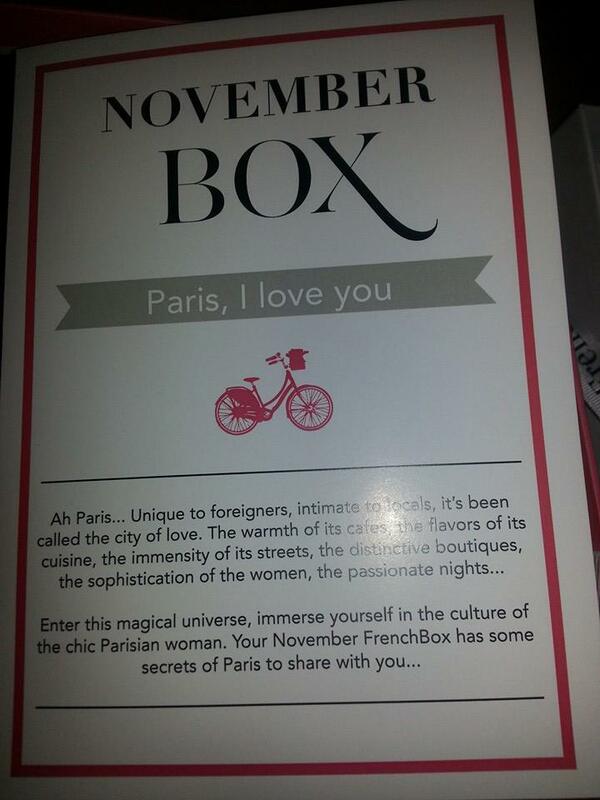 There it was, the November box…être encore , mon cœur! Yes…Yes, indeed, Paris is always a good idea. Particularly when one is wasting away in a central California valley rural community. Le sigh. The theme for November is “Paris, I Love You.” Although I’ve never been there, I can say without hesitation that, yes, Paris, I love you. Or what I imagine you to be, somewhere between Utopia and Heaven. Okay, let’s see what else is in this box of French wonders. I’m in love already and I haven’t even touched any of the products. 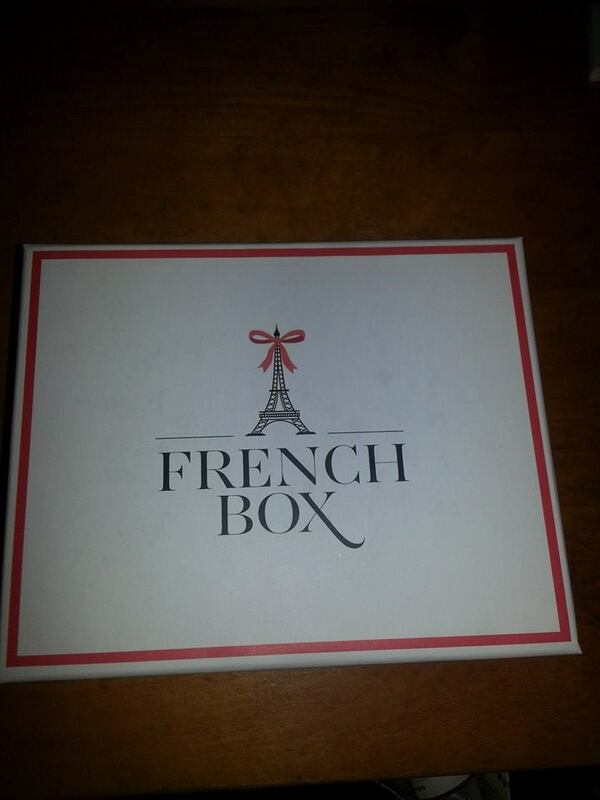 I can practically SMELL the French awesomeness emanating from the box….Let’s check everything out! I applied a dab of this to my hand to try it out. Ooh la la. My hand feels soft and silky after just a few minutes. This is a mask that you apply, wait 10 minutes, and then rub in whatever remains atop the skin. J’adore. I’m already swooning. I snatched this up and did a happy dance. COFFEE. 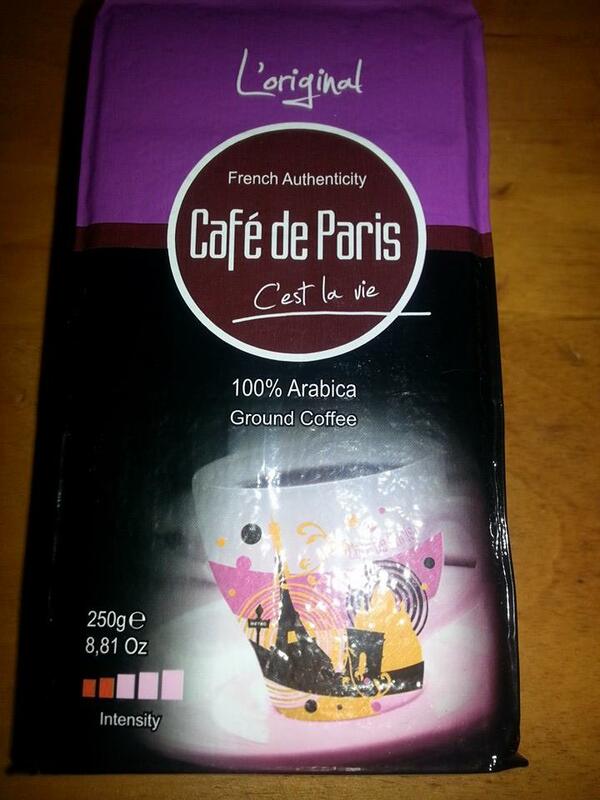 REAL FRENCH ROAST COFFEE. Not the Starbucks version of French Roast or any other non-French-produced French Roast coffee, but coffee really and truly made in France. I’m an absolute coffee-holic. Iced, hot, cappy’d, latte’d, frappy’d, you name it. Even my favorite ice cream is coffee flavored. I’m thrilled with this and intend to enjoy it one perfect cup a day to make it last as long as possible. From Segafredo Cafe de Paris, “its rich, aromatic flavors will leave you craving for a little bit more French throughout the entire day…” Oh, it already has. Parfait!!! And what is this round, perfectly French item? 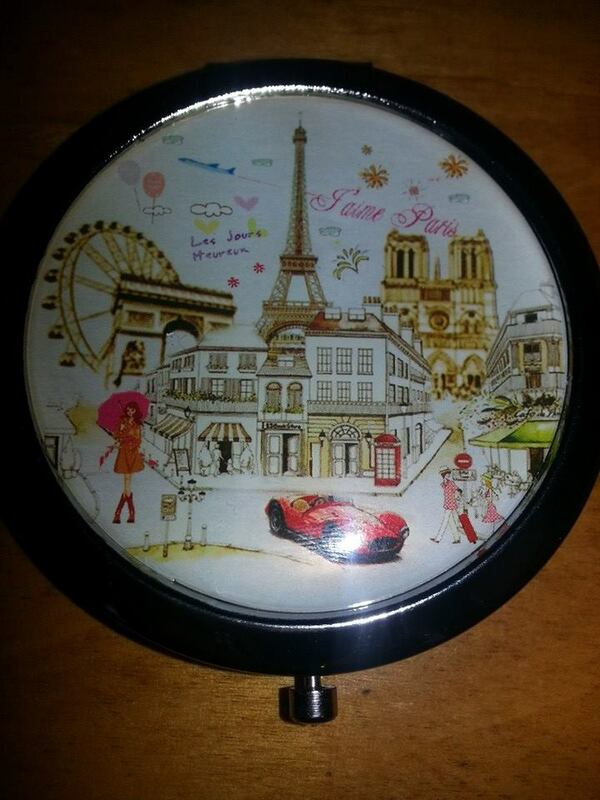 Okay, this is seriously THE cutest compact I’ve ever seen. 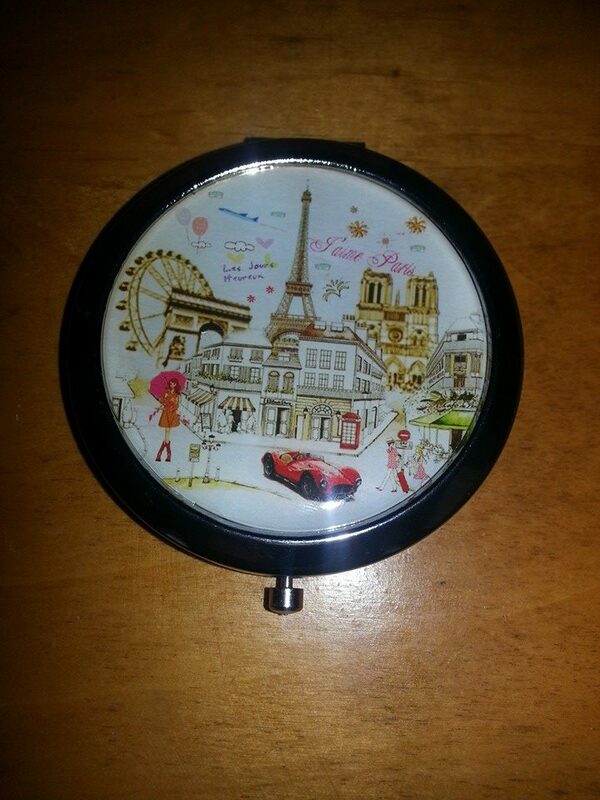 The Paris Pocket Mirror is distinctively French and the perfect size, it contains two mirrors, one in the top half and the other in the bottom. It’s beyond UH-DORABLE. This is definitely going straight into my purse and I’ll be whipping it out at every opportunity to show people how utterly awesome it is. These pictures don’t even do justice to its cuteness. 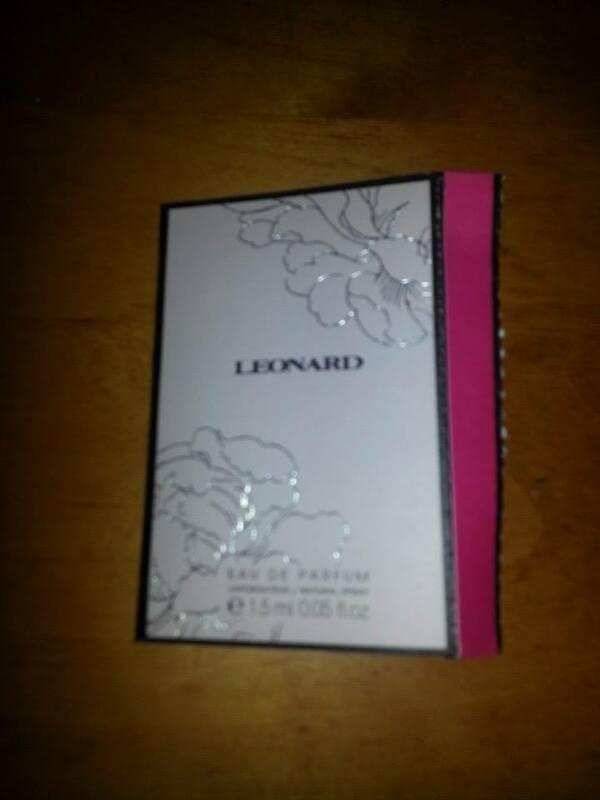 Here we have a sample vial of Leonard Eau de Parfum Signature and it smells DIVINE. I’ll be treasuring this little vial and using it for special occasions when I want my sense of smell to transport me directly to Paris. 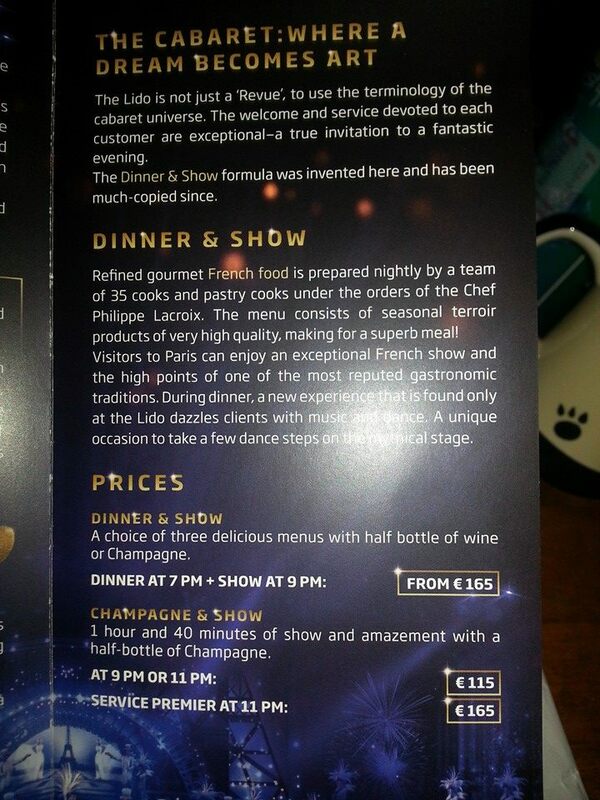 Ooh la la indeed. Oh my…Next up is another recipe card (last month’s box had a recipe card for a few menu ideas for utilizing the Herbs d’Provence contained in the box). 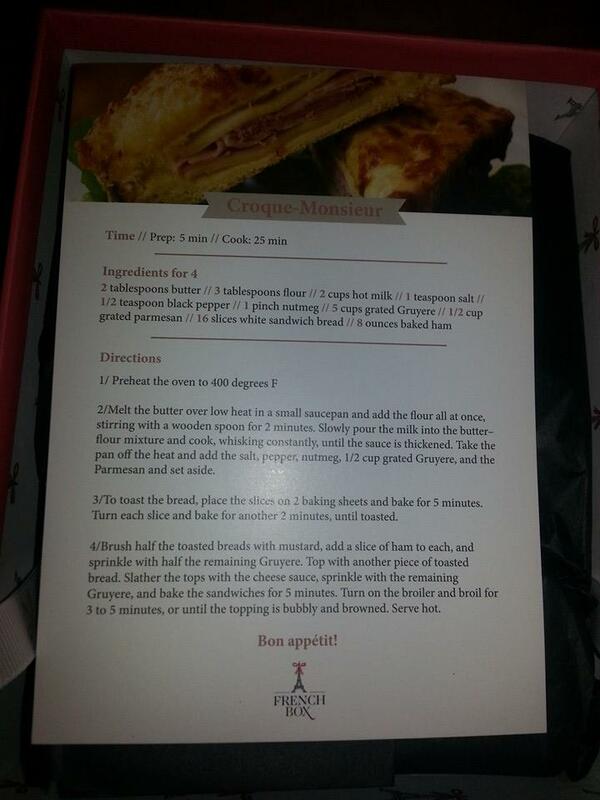 This month’s recipe is for Croque Monsieur, which is an extremely delectable-looking sandwich that actually makes me want to throw my Subway Club sandwich sitting next to me off of my balcony. It looks amazing and anything that contains Gruyere cheese is going to be a home run with my cheese-loving self. 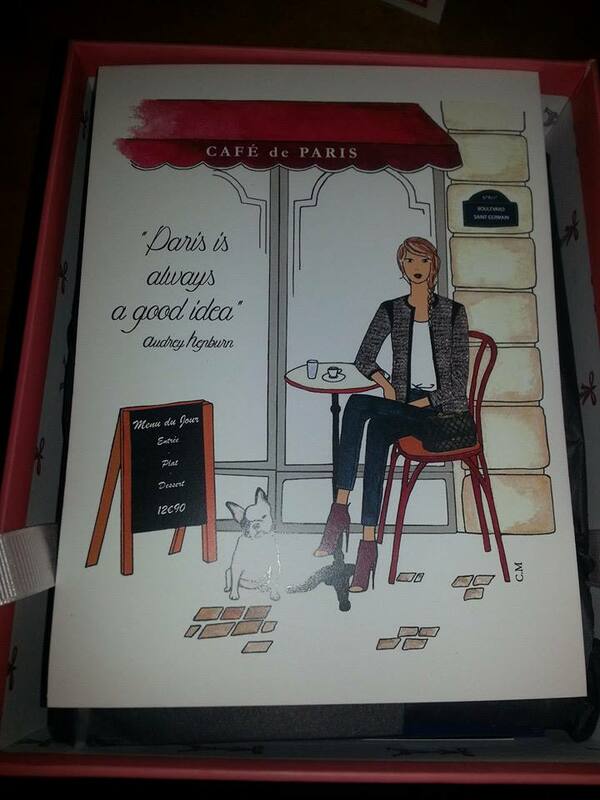 Nice touch, French Box, Keep those recipes coming! 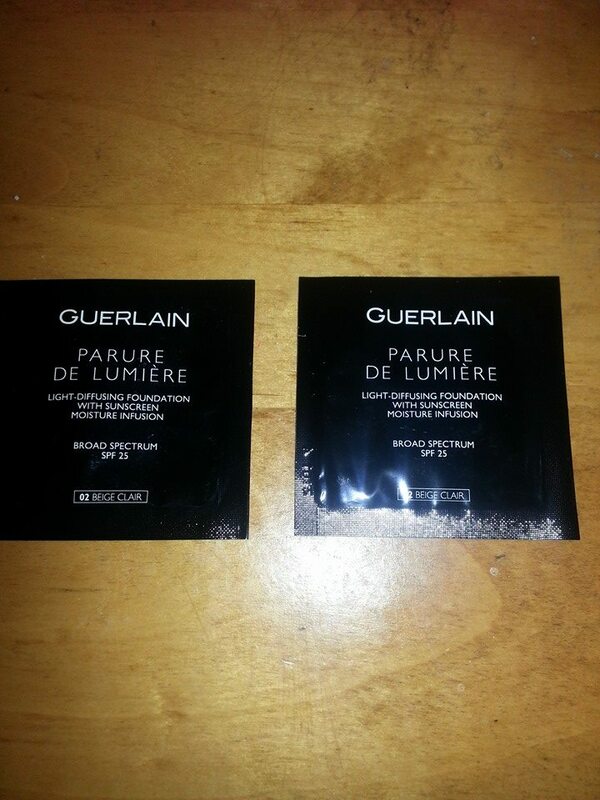 The last item in this month’s box are 2 sample packets of Guerlain Foundation Parure de Lumiere. I’ve tried a few Guerlain products in the past (and loved them), but I’ve not tried this particular foundation. 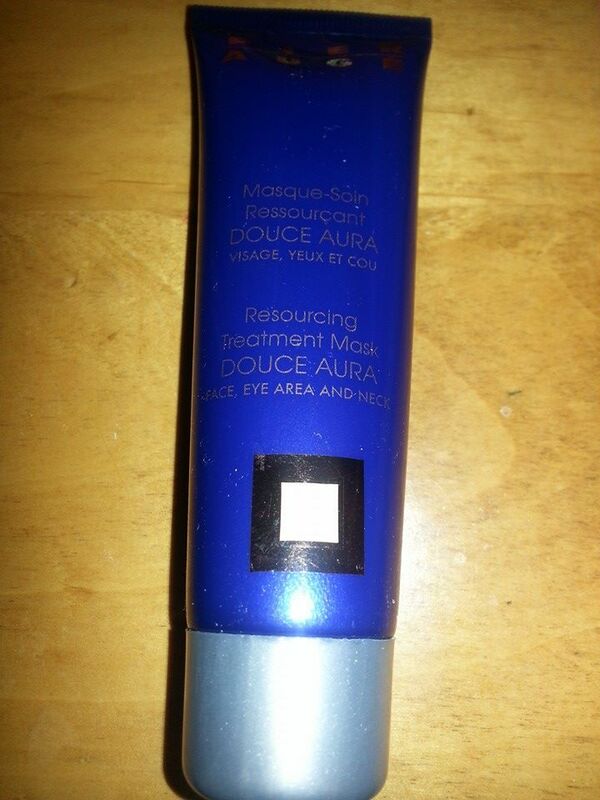 This one is moisturizing and contains light-diffusing ingredients as well as SPF 25. The active ingredient is Luminescent Water, a marine spring water that hydrates the skin and diffuses light at 360 degrees to create a radiant complexion. The color is conveniently the perfect shade for my skin (woot!). I can’t wait to give these a try. It’s medium coverage, which should also be perfect for me. 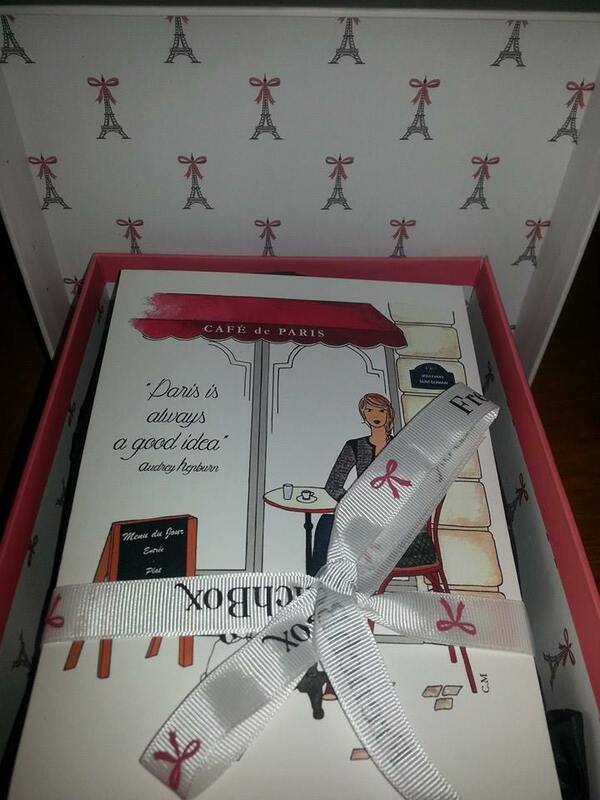 TOTAL RETAIL VALUE OF “I LOVE PARIS” BOX: $73.50 (not including a value for the adorable postcard, the sample Guerlain products, the recipe card, or the Leonard perfume). 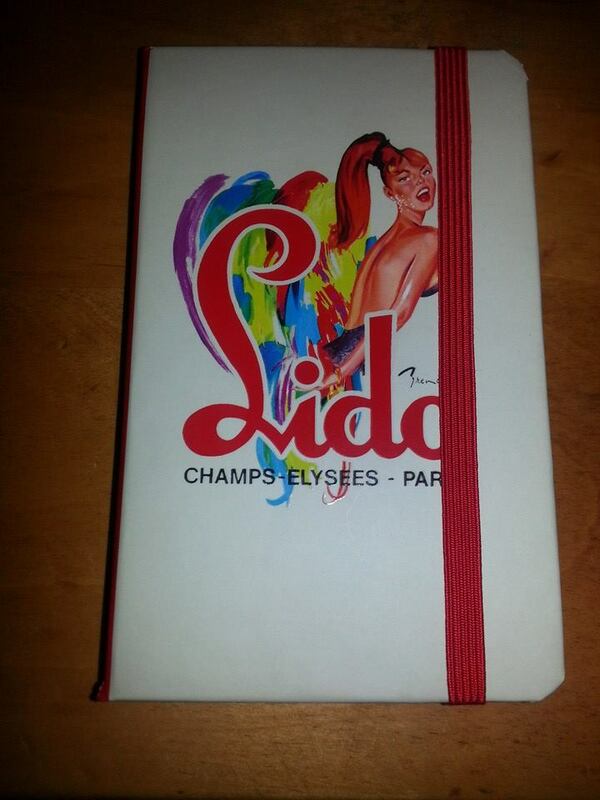 Once again, I am completely blown away by The French Box. Just opening the box immediately allows me to escape the day-to-day banalities and be mentally transported to a faraway place I’ve only seen in my dreams. I find the curating of the box to be top notch and brings me such a nice variety of things to taste, see, smell, and feel. I’m definitely still carrying on my own personal love affair with the French Box. If you’d like to check out the French Box, here are some links to help you get started (pssst, The French Box would be a PERFECT gift for any lovers of all things France on your holiday gift-giving list this year). And I am now departing from my all-too-brief imaginary trip to Paris and back to my American apartment in central California. The struggle is real. Le sigh.